On the right, the hole in the side of the U.S.S. Cole that al Nashiri (left) is accused to have planned the bombing of. The U.S. ship was docked in a port in Yemen during the October 2000 attack that killed 17 U.S. sailors and wounded over 30. During the first week of October 2014, I plan to travel to Guantanamo Bay, Cuba as a representative of the U.S. Military Commission Observation Project (MCOP), which is also known as the Gitmo Observer. 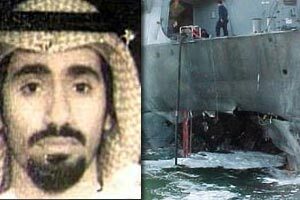 While at GTMO, I plan to observe military proceedings in a capital case against Abd al-Rahim al Nashiri, whom the United States Government has accused of planning the bombing of the USS Cole in October 2000, which resulted in the deaths of 17 U.S. sailors. The U.S. Military Commission Observation Project (MCOP or Gitmo Observer) was established by the IU McKinney Program in International Human Rights Law. MCOP was granted “NGO Observer Status” by the Pentagon in 2014. This means that MCOP representatives may travel to Guantanamo Bay (or view a secure video link at Fort Meade in Maryland) to observe trial procedures at GTMO that are otherwise inaccessible to the public. As an NGO Observer, MCOP seeks to ensure that fair trial rights are afforded to all stakeholders in the observed proceedings. These stakeholders include the defendant(s), victims and family members of, and the prosecution. Representatives of MCOP will observe, document, critique, and analyze these proceedings with the help of a Fair Trials Manual and Checklist, which can be accessed here. 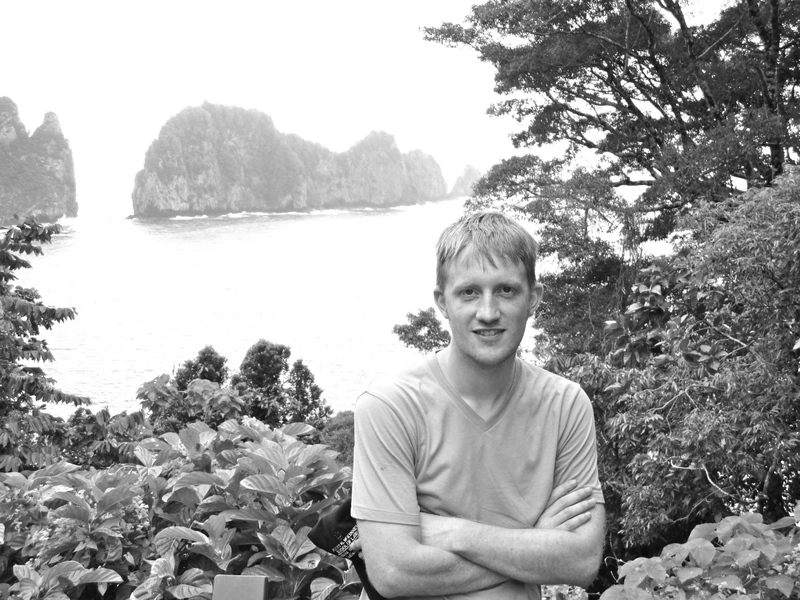 Photo of me taken during the 2014 summer in Pago Pago, American Samoa, during my IU McKinney Law International Human Rights Law internsip. 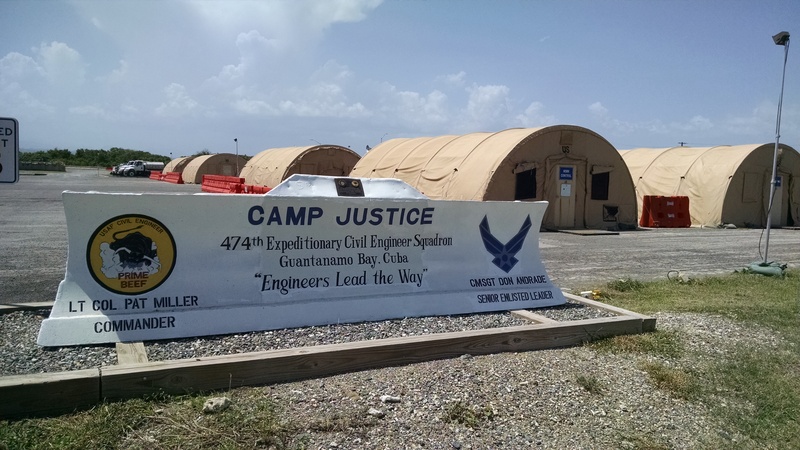 Jeff Papa at Guantanamo Bay’s Camp Justice, before hearings opened today in the war crimes case against Hadi al Iraqi. Hadi al Iraqi was arraigned at Guantanamo Bay on 18 June 2014 for war crimes allegedly perpetrated in Iraq and other countries when he was a senior member of al Qaeda Iraq and liaison with the Taliban. Hadi’s first pre-trial hearing was set to begin today at 9:00 a.m., but was delayed until 1:30 p.m. The judge noted that in conference the previous afternoon, the defense had asked for a delay until 1:00 for Hadi to meet his new counsel, whom Hadi would have met for the first time. Defense had then asked for an additional 30 minutes to accommodate prayers. Jeff Papa at Camp Justice, holding folder with an Indiana logo. Jeff Papa reported that the Hadi al Iraqi hearing commenced today at 1330 (Monday, 15 September 2014). Due to erratic internet connections, he could not send in his commentary on the hearing. He was able to send this photo. He promises more later. “Camp Justice” is the name of the barracks-like Tent City where NGOs are housed at Guantanamo Bay. Immediately to my left, out of the camera’s view, is the court house complex. The military instructed us to arrive at Andrews Air Force Base no later than 0630 this morning for our 10 am flight to Guantanamo Bay, Cuba. There was some confusion since the address given for the Andrews Visitor Center was apparently wrong. Several of the nine Non-Governmental Organization (NGO) representatives traveling with us arrived at the Andrews main gate, and got turned back. One of our escorts arrived at 6:30 and transported us to the air terminal on the base. As those familiar with the GTMO process know, the planes to Guantanamo contain many different categories of participants, including the presiding officers, defense counsel, prosecution, victims’ family members, NGO representatives, and the media. Today was no different. We met several of these people, including Carol Rosenburg of the Miami Herald who routinely covers GITMO proceedings (she mentioned Indiana’s own Justice Steve David, who served here previously). The flight to Guantanamo was a little over three hours. The weather on arrival was perfect – blue sky and temperatures in the 80s. 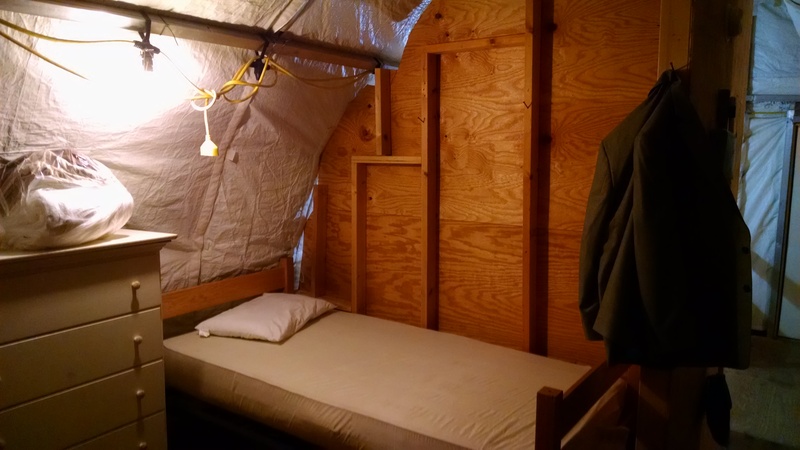 This is my bed for the next few days at Guantanamo Bay. They keep the tents very cold to discourage bugs, banana rats and iguanas. We took a ferry from the airfield across the bay to the main base area and were escorted to our quarters – barracks-like tents kept ice cold to discourage bugs, banana rats and iguanas from intruding. Unfortunately, a change in access now prevents non-military persons (like the NGOs) from accessing WiFi in the area where our tents are. No mainland U.S. wireless carriers function here. We also have no access to Cuban carriers. We received photo identification badges that give us access to the courtroom. We then visited the Navy Exchange store for supplies. Still no WiFi was available. We finally found a restaurant with extremely slow WiFi some distance away – but too slow to upload or download much more than email (thus no photos with this posting, at least not today). Front cover of Guantanamo Bay Fair Trial Checklist. It has been well-received at Guantanamo Bay. Prosecution and defense counsel met with the judge this afternoon to review the schedule for this week’s hearing. It is rumored that tomorrow’s hearing may start late as defense counsel is transitioning and the accused, Hadi al Iraqi, has not yet met the incoming counsel. 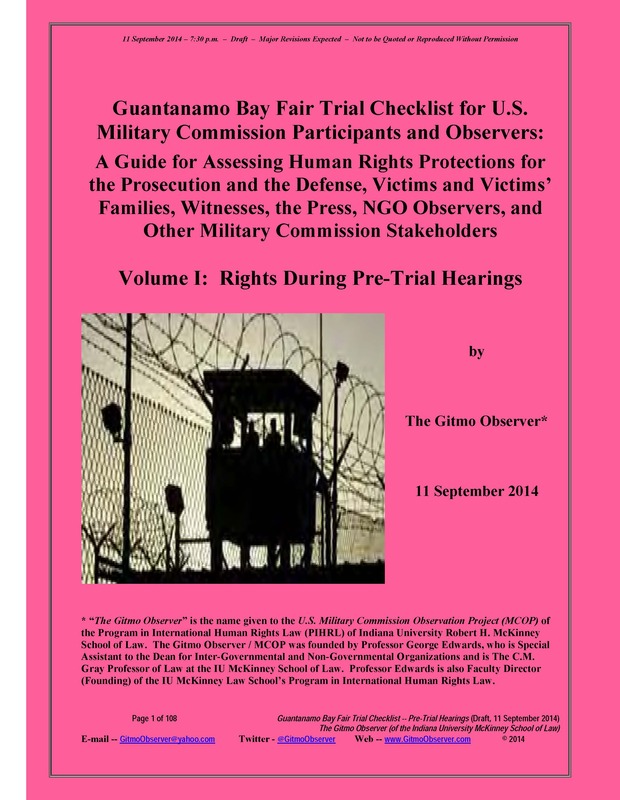 The newest draft of the Guantanamo Bay Fair Trial Checklist prepared by Professor George Edwards and his law students at the Indiana University McKinney School of Law has been well-received by the other NGO representatives (a very diverse group). I believe the Checklist is quickly becoming the “must have” guide for NGOs observing GITMO proceedings. NB: Update just in… Hearings will not begin until 1300 hours tomorrow (Monday afternoon, instead of 9:00 in the morning as scheduled). And a few photos made it through the slow internet connection. 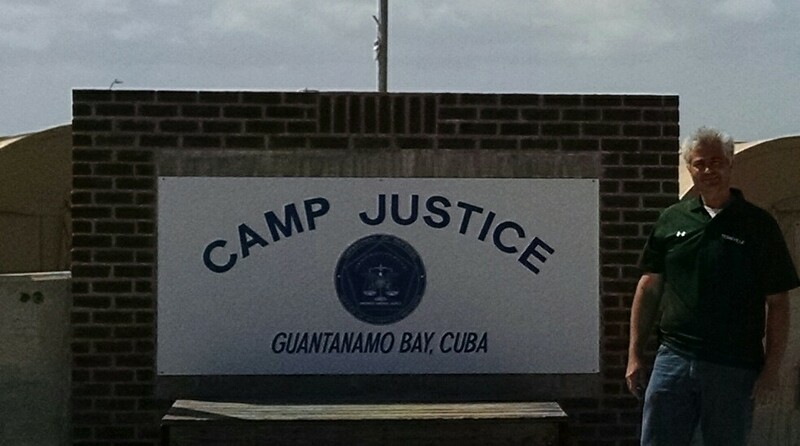 Another view of the front of Camp Justice. I am scheduled to travel to Guantanamo Bay, Cuba for pre-trial hearings beginning Monday, 15 September 2014. I have reviewed many documents related to the case I will monitor – against alleged senior al Qaeda in Iraq official named Hadi al Iraqi, who is said to have been a liaison with the Taliban. Hadi al Iraqi’s charge sheet is posted here on the Gitmo Observer website, where other basic Military Commission documents can be found. My role is as an “NGO Observer”, sent to monitor the proceedings and determine for myself whether, based on the law and my observations of facts, I believe that stakeholders are receiving a fair trial. My most important tool for preparing for this mission is the newly launched Guantanamo Bay Fair Trial Checklist, which provides a framework for me to conduct monitoring. I have read and re-read the Guantanamo Bay Fair Trial Checklist, which is an innovative document created by Professor George Edwards, the Founding Director of the Program in International Human Rights Law (PIHRL) of the Indiana University McKinney School of Law. Edwards is also the founder of The Gitmo Observer – also known as the U.S. Military Commission Observation Project (MCOP) of the PIHRL. Volume I of the Checklist identifies a list of right for stakeholders during pre-trial hearings. While this document will be further developed by PIHRL students at the McKinney Law School, the current version includes a comprehensive list of rights for victims, victim’s families, the accused, the prosecution, the press, and witnesses. The Checklist is very easy to use, and should be utilized by any observer of commission proceedings, whether they want to quickly learn basic facts or want to study in great detail a particular hearing. The Checklist contains sources of domestic U.S. and international law for reference, and provides easy to understand, but comprehensive, checklists for each possible right, as well as general background information. If you review available background information about a particular hearing you will monitor, and then reading through this Checklist step by step, you will gain a very deep understanding of the issues involved, as well as the likely legal arguments, strengths and weaknesses of each party’s position. The Checklist provides an objective, neutral framework for analyzing the commission proceedings. The Checklist will become the standard document for those new to commission observation, as well as for seasoned experts. Volume I of the Checklist covers pre-trial hearing stage issues, as that is the current stage of the most Guantanamo Bay proceedings today. But many of the Checklist considerations are entirely relevant to other phases (pre-hearing, trial & judgment, and post-trial/post-judgment). Future Volumes of the Checklist are planned to cover these remaining phases in a comprehensive manner. In the 2014 summer, I traveled to Ft. Meade, Maryland to observe a different Military Commission hearing. I did not have the benefit of the Checklist , which had not yet been created. I read many documents for the earlier proceeding. I wish I had had the Checklist then. In preparing for my hearings at Guantanamo Bay next week, I appreciate that the Checklist is well-organized and clarifies the issues in my mind, and provides a very logical flow regarding what issues are likely to arise in a particular proceeding. This Checklist will become the standard for reviewing commission proceedings. Following the Checklist through its stages is easy to follow, and ensures that all issues are covered. The references to source law and rights within the document is also extremely helpful. 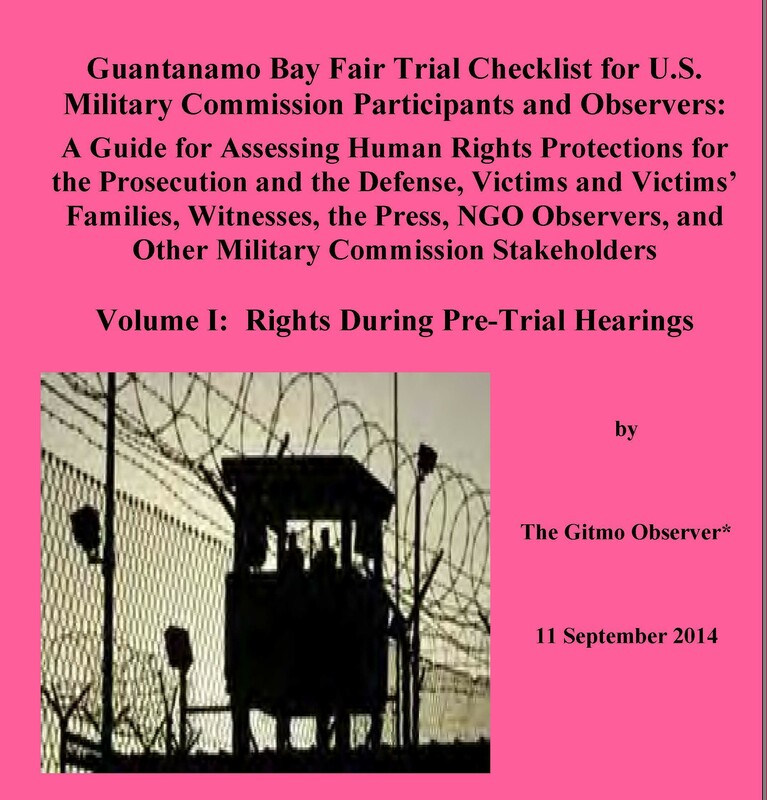 The full name of the Checklist is the Guantanamo Bay Fair Trial Checklist for U.S. Military Commission Participants and Observers: A Guide for Assessing Human Rights Protections for the Prosecution and the Defense, Victims and Victims’ Families, Witnesses, the Press, NGO Observers, and Other Military Commission Stakeholders.